According to the textbook definition, kayaks are small, narrow watercraft propelled by a double-bladed paddle. Pedal kayaks totally dismantle that definition. The revolution of dedicated fishing kayaks with vastly increased dimensions torpedoed the first part of the definition. Sit-on-top fishing kayaks abandoned the low center of gravity for stability that was a feature sit-inside traditional kayaks, and now average well over 30 inches in width to make up for it. But it was the adoption of the first widely-accepted pedal kayaks in the early 2000s that shattered the classical kayak definition. Instead of paddling by hand, pedal kayaks relied on leg muscles for propulsion, which naturally freed up the hands for fishing. Piloting a sit-on-top kayak using paddle a was always a compromise, as a traditional kayak maximized stroke leverage from the pilot’s position closer to the water. Suddenly kayak seats could be elevated to maximize comfort. Traditional kayaking purists may lobby for a name change (“small pedal-powered fishing craft” seems right). But from a fishing perspective, pedal kayaks have become the ultimate low-maintenance fishing platform. But what factors should a prospective buyer look at in choosing the best pedal kayak? We'll do our best to help. When trying to understand whether a pedal kayak is right for you, it helps to break the decision down in a criterion-by-criterion basis. Each carries its own benefits and drawbacks. Rotational pedal/propellor kayaks operate much like a recumbent stationary bicycle, while a drive drive shaft powers a propeller directly underneath the craft. The engineering is straightforward and is the basis of all but one pedal system on the market. The primary advantage of rotational/propeller drives is that reverse is instantaneous and achieved just by pedaling backward. It's about as intuitive as it gets. Retracting the propellor drive for operating in shallow water requires swinging it upward, which can take several steps to accomplish and effectively disables the drive unless there's enough clearance. Propellers can get also wrapped in seaweed, further limiting shallow-water performance. Reverse requires “changing gears” with a hand toggle vs. the natural reverse-pedaling motion of the propeller drive kayaks. At the limit of the drive fins’ range of motion, they're nestled against the hull, making shallow water operation very easy compared to pedal drive kayaks. The pedals can also be "short-stroked," so to speak, within a few inches of the full range of motion to maintain forward propulsion in just a few inches of water. Lastly, because the motion is back and forth when compared to propellers, tangling in seaweed is far less of an issue. Stability is one of the most important factors that separate modern sit-on-top kayaks from their more traditional sit-inside brethren. Sit-on-top kayaks have very high primary stability, meaning they’re relatively more difficult to tip within the first 10 degrees of lateral tilt. This is important for kayak fishermen, who need this primary stability to fight fish, and even stand up to sight cast in calmer waters. Most fishing kayaks are rated to carry anywhere between 400 and 600 pounds. Granted, because their fitted weights (meaning removable drive and ands seat included) can begin approaching the 200 pound mark, pedal kayaks might leave you with less overall carrying capacity than you expect. In the end, how a kayak feels is a combined function of its stability and capacity. When in doubt, better to test drive the kayak to understand how its capacity and stability intersect for your specific angling style and needs. 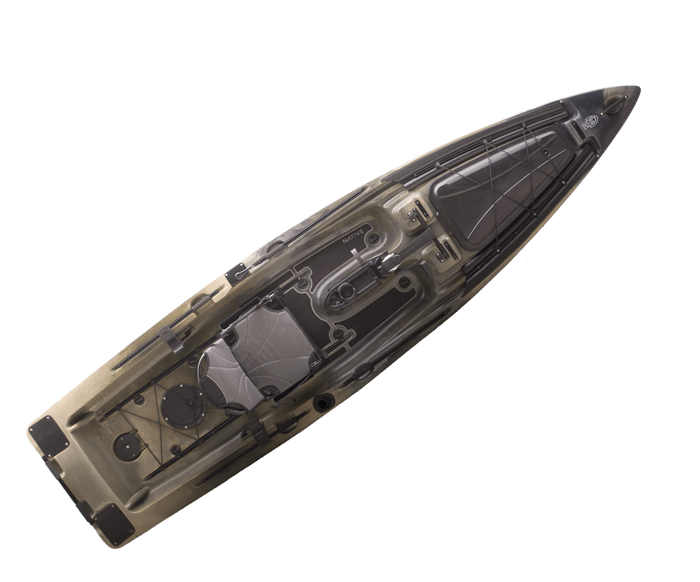 Most modern open-top kayaks’ hulls are made from roto-molded polyethylene, which is more forgiving than fiberglass, both from damage and on the wallet. But it comes with a weight penalty. To make fishing kayaks more stable required widening their hulls and adding structural flourishes to the purely rounded hull cross-section of traditional kayaks. Adding molded-in hull features, accessory mounts, handles, and other angler-friendly accoutrements added further weight. When pedal systems arrived, the areas of the hull around the drive systems were thickened substantially around the drive well area to compensate for increased stress. This meant that a kayak with identical hull dimensions just weighted more. Add up all these developments, and you're left with a class of small craft that are much more unwieldy than their paddle-driven siblings. Like we said earlier, we need a new name! Managing that weight begs some extra thought when purchasing. A 120-pound kayak can be car-top-able with a aftermarket roof rack system, but a 180-pound kayak more likely needs a dedicated trailer. Sure, every kayak angler has visions of standing up to battle a catch, but 99.99% of the time, you'll be sitting in the kayak's chair. And unlike the first generation of kayak seats seemingly evolved from bleacher pads, these seats acknowledge that the pilot isn't just sitting there. Because the chair has to accommodate casting, pedaling, and the occasional paddle to boot, it's important to consider build quality, adjustability, breathability, and support when considering seating. Some manufacturers have put more time into their seating than others. Depending on your age and physical fitness , some of the more entry-level models may not offer enough support. Fishing is a gear sport. 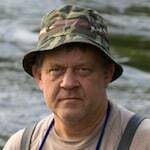 Sure, anyone can go to the local pond with a cane pole, a dozen yards of monofilament, a bobber, a hook, and a worm. But the more serious an angler is about being able to catch fish on any given outing, the more gear they need to locate fish and adjust fishing tactics. Fishing kayaks, and the best pedal kayaks in particular, offer the ability to keep as much gear as possible close at hand. Fishing kayak storage all starts on the deck in the form of open, inset, bungee-able recessions, usually most common behind the seat. These areas accept any manner of bulky cargo, including coolers, live wells circulating water into a fish holding tank. Pedal kayaks’ elevated seats often add even a bit more deck space compared to traditional paddle kayaks. Waterproof hatches sunk into the deck at various points provide access to the hull’s interior. This is a good place to store heavier or less frequently accessed gear, while kayak camping for example. On some craft, these areas can be filled partially with foam, increasing positive buoyancy in an emergency but cutting into free space for cargo. Vertical rod holders are useful for immediate access and to hold the rods when trolling. Horizontal rod holders are used to store rods out of the way of the immediate action, and can even hold rods when transporting the kayak. Given the accessibility of kayak fish finders, mounting their transducers is a significant consideration. Some pedal kayak manufacturers are 100% on-board with the FishingTech vision, having included transducer mounting plates as hull features below the waterline, and have scupper holes specifically set aside for routing cables. Although this may slow down the process of removing the transducer if the owner has to store the kayak in an unsafe place, if you can safely store the kayak the feature is a boon. As anglers, and tech-savvy anglers to boot, this is going to be a huge factor in suitability for fishing. We're going to dive in on our top five choices and give a brief overview on where we think they fall in the spectrum. Bear in mind, these are all great choices for different reasons, and represent quality choices. The Perception Pescador Pilot 12.0 represents an affordable entry into the best pedal kayak category. Significantly narrower than the others in the category, the Pescador was by far the lightest in the category, tipping the scales at less than half some of the heaviest entrants. Despite its diminutive girth for the category, the Pescador still manages significant storage. This includes a roomy open forward deck well covered by a stretchy bungee cover, an area reserved in most models for one or more large forward hatches. The side rails feature built-in YakAttack-style accessory tracks, as well as four molded-in rod holders. Some reviewers have claimed that the rotational pedal drive feels less efficient than the larger entrants into the category. Overall, the drive has a much less beefy construction compared to the other pedal-and-propellor entrants, which isn’t surprising given the price point. Further, retracting the drive up and out of the way requires two pins and a couple more steps than the others. In fact, the company was reported to have some initial issues with the drive and the system that they rectified shortly after launching the product. Stability is not great compared to the other kayaks reviewed, but that’s about as expected given the overall weight. See our in-depth Perception Pescador Pilot 12.0 Review. Old Town is a storied canoe manufacturer that only recently moved into kayaks, and they’ve joined the pedal kayak fray with the Predator PDL. The kayak screams quality, befitting the age of Old Town. The drive system feels significantly more solid than some of the more entry-level pedal kayaks, and the seat as well. The controls of the Predator PDL feature an oversized rudder knob instead of a handle, a surprising ergonomic choice that some users reported gave them some leverage challenges. The rudder lift lever on the right side was also far more robust than anything else reviewed. Dedicated fishfinder transducer mount behind the keel at the aft trailing edge of the boat, a placement reminiscent of transducer locations on much larger fishing boats. It’s pre-drilled with brass inserts and features a dedicated scupper hole for routing wires without having to drill through the hull. Stability fell into the middle of the range for the category. Old Town reportedly has an oceangoing version in the works, which may bump up its stability characteristics. See our in-depth Old Town Predator PDL Review. Native Watercraft is a long-time kayak maker that was one of the pioneers in the pedal kayak boom of the early 21st century. The company's Slayer Propel 13 shares a common drive for all Native pedal kayaks, which the company calls the “first with reverse.” It’s a rival in quality to the much heralded Hobie Mirage Drive, with the added advantage of being able to go in reverse simply by pedaling backward. One feature that sets Native’s pedal drive apart is its complete enclosure of anodized aluminum. It’s solid-state. Where the drive is a plus, many reviewers noted a rudder strength issue. Unlike the rudders on some other pedal kayaks, the rudder can’t full retract into the protection of the hull. This can potentially lead to damage during the inevitable slide and shuffle when transporting the kayak the last dozen yards to and from the water. The Slayer Propel 13 represents a mid-point for Native’s pedal kayak line. It features a tunnel hull that adds stability and enables the propellor to nest closer to the hull bottom, reducing the depth required to navigate with the pedal drive engaged. The still small enough to paddle easily, which can’t be said for some of the larger category entrants. From a storage perspective, the Propel 13 falls into the middle of the pack. Standard gear tracks and rod holders come aplenty, which means it’s relatively easy to use aftermarket mounts. See our in-depth Native Slayer Propel 13 Review. The first thing even less-than-savvy buyers will notice is the Titan’s huge departure in hull shape from the rest of the field. From above it’s closer in shape to a bass boat than a traditional kayak. This shape comes with a stability bonus, but fans of boat design will recognize that there’s trade-off there for an efficiency penalty. The hull innovation goes beyond skin-deep. The polyethylene hull is foam-filled, like a Boston Whaler. This equates to extreme rigidity and buoyancy. Some reports did point drainage challenges similar to those reported on the Slayer. The boat is also boast a litany of angler-friendly gear accommodations. The underside of the hull features a recessed transducer mount, and there are twin stakeout pole mounts at the corners of the full-width stern. Most impressive of all, the boat features a transom-style trolling motor mount set for of the drive well. It’s a great feature that drops the prop into the center, making for some nimble maneuvering when under power. As you might expect, the boat features loads of storage, with a rail mounting scheme that mirrors the smaller Slayer series. The seat rests on rails, so positioning is infinite. The seating rails run the length of the sidewalls, so it’s actually able to accommodate a second passenger, but your mileage may vary depending on size. Some reviewers had been reporting PDL drive cavitation issues in initial iterations, which were apparently resolved this year by lopping the ends off the prop and increasing the blade pitch. See our in-depth Native Titan Propel Review. 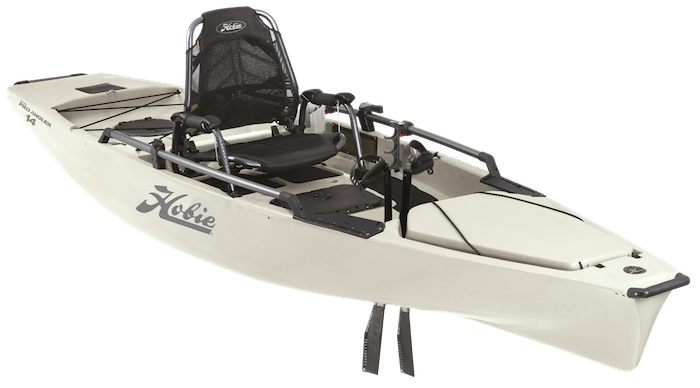 The Pro Angler 14 from Hobie rounds out our best pedal kayak category rundown. The first PA14 was introduced way back in 2009, so we’re now a couple generations into the Pro Angler’s journey. The original 14-footer has since been joined by a 12-foot model as well as a 17-foot tandem battleship of a kayak. When the Pro Angler 14 first came out, it was a category-killer and its reputation hasn’t wavered. It’s powered by the Hobie Mirage Drive, one which we could write volumes. As noted in our value overview, it’s quieter than the pedal drive system currently available. The most significant drawback — a reverse gear that required physically removing and reversing the Mirage Drive in its well — was solved in the 2017 model year with the Mirage 180. With the pull of a cable loop, the fins now reverse on their individual rigid masts. It’s not nearly as instantaneous and hands-free as the simple backward pedaling required of the more common propeller pedal drive, but the change definitely was a ding to some of the Mirage Drive’s critics. This was a boon for a boat as big as the PA, which is difficult to maneuver with a paddle, the angler’s other solution to go astern. The storage layout is reminiscent of the Native Titan’s, with a large forward hatch, and smaller rear hatch set into a flat cargo recess behind the seat. The Hobie features a combination of two accessory mounting approaches. Hexagonal H-Rails, Hobie’s proprietary mounting rails, run almost the full length of the pilot area. Unlike universal gear tracks, the rails require Hobie’s proprietary clamp-mounts. Going all-in on Hobie accessories can break the bank. As an alternative, the PA14 also features drillable, replaceable mounting plates at the cockpit’s two forward corners. Overall, the boat just drips quality right down to the amazing Vantage Seating, and the same can be said of the company itself. Customer service is great, and matched only by Hobie customer loyalty as evidenced by the company’s kayak fishing forums. See our in-depth Hobie Pro Angler 14 Review. Every year there are more contenders for the best pedal kayak crown, so these are interesting time for what was a sparse field just a decade ago. Picking from them is a difficult business, but after deliberation we've arrived at winners of our three category awards. The only category entrant with a "1" to lead off its price tag, the Perception Pescador Pilot 12.0 is our choice for the Accessible Tech Award in the pedal kayak category. 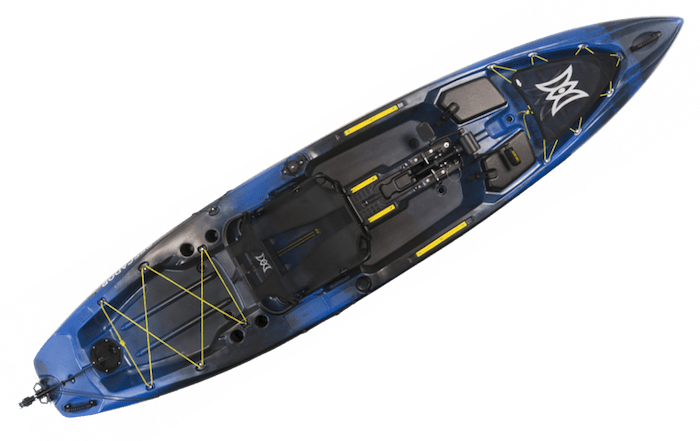 The boat boasts just enough features to satisfy the small craft angler looking to break into pedal kayak fishing for the first time, or even those looking for a second, lightweight craft that won't break the bank (or the spine) to keep on hand in addition to some of the category's heavier, pricier entrants. 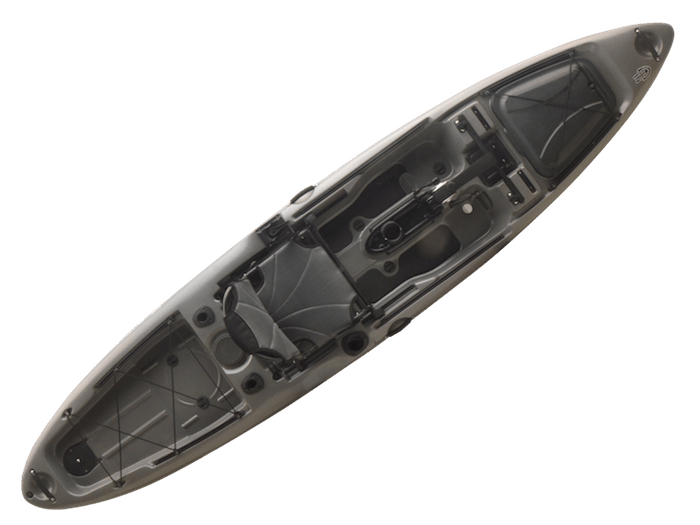 With its unique hull shape, among them angler tech-first features including the center-mounted trolling motor transom mount and stakeout pole mounting plates, the Native Watercraft Titan Propel 13.5 is our choice for Tech Innovator in the pedal kayak category. Since its release, the boat has been joined by other, smaller models in the same line, but the 13.5 is still Native's flagship. If you have the means to acquire one, the Hobie Pro Angler 14 is simply the Cadillac of fishing kayaks. It's replete with category-leading features, and boasts category-leading quality. 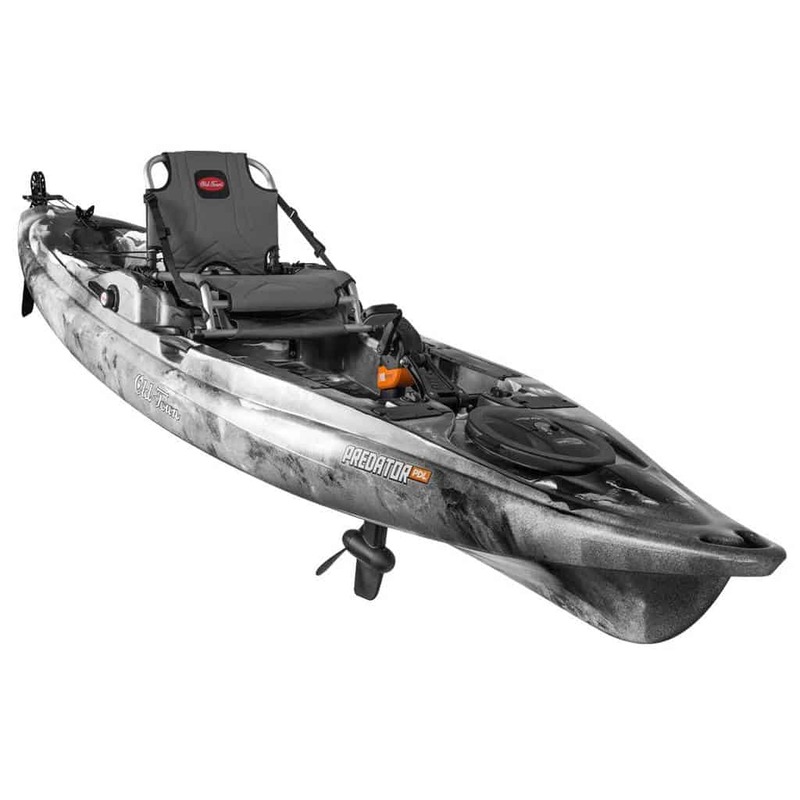 It's the clear choice for category winner for Best Pedal Kayak for Fishing. Owning one is a lifestyle choice of sorts given the company's place in the market. And the company doesn't rest on its laurels. Each year, Hobie's engineers further refine the kayak that blew up the category a decade ago.